Enterprises: Google wants you. That's the message coming out of the first keynote address at the company’s Google Cloud Next conference in San Francisco on Wednesday. The tech titan's cloud team really wants enterprises to know that it's serious about serving their needs. 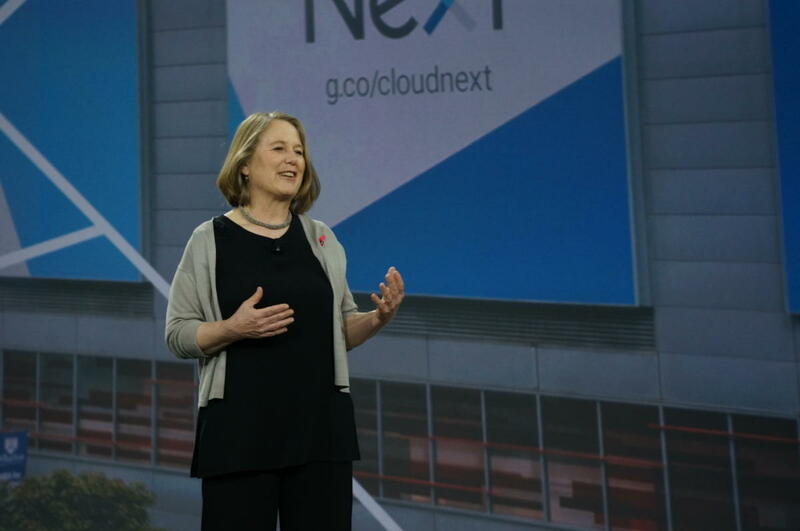 Diane Greene, the senior vice president of Google Cloud, showcased a suite of partnerships and customer announcements that provided concrete results for the enterprise-focused strategy that Greene kicked off when she joined Google in 2015. Google hasn't always focused on the enterprise. The announcements showcased on Wednesday show that the company's initiatives to make its G Suite productivity service and public cloud platform offerings have been resonating with customers it may not have reached in the past. The difference between where Google is now in regard to the enterprise and where it was is "night and day," Gartner Vice President David Mitchell Smith said in an email. For example, Colgate-Palmolive migrated 28,000 of its employees to G Suite last year, and Verizon plans to move 115,000 employees to G Suite this year. Disney, eBay, and Home Depot highlighted their use of Google's cloud platform services to power components of their businesses, as well. Last year was Home Depot's busiest Black Friday in terms of customer load on its services. The company was running "reasonable portions" of its e-commerce infrastructure on Google Cloud Platform, said Paul Gaffney, the retailer's senior vice president of information technology. According to him, it was the smoothest Black Friday ever. While those wins provide a useful glimpse into what Google has been up to, the company also announced a set of new partnerships aimed at helping serve the needs of large customers. Greene revealed a new partnership with SAP aimed at boosting Google's enterprise software capabilities. The enterprise software vendor's HANA relational database management system is generally available on Google's cloud as of Wednesday, including an express edition for developers that can be purchased on-demand. Google is also working on building tools for compliance and data governance to help large businesses move to the cloud in partnership with SAP. One of the key announcements the company made to appeal to enterprises and businesses of all sizes was around customer support. The company is overhauling its support tiers for GCP, charging customers flat fees per user per month, based on the level of support each user needs. That means engineers who can wait up to eight hours for a response will be able to get that level of service for US$100 per user per month, those who need a one-hour response time get that for $250 per user per month, and those who need a 15-minute, 24/7 response time pay $1,500 per user per month. Companies can mix and match support tiers for each user inside their organization. That means it's not necessary for business users to pay companywide for the fastest support if only one project needs that much help. Greene also announced a pair of partners aimed at helping to scale that support to more customers. Pivotal is working with Google to make sure that customers using GCP and Cloud Foundry build applications that are highly reliable. Rackspace has become the first managed services support partner for Google's cloud service offerings. It will provide customers with a variety of services, including help with migration, cloud architecture, and ongoing support for Google Cloud deployments. Wednesday's news comes after a host of announcements Tuesday aimed at boosting Google's cloud partner ecosystem. The company is offering its partners a set of new fiscal incentives to help grow their businesses, along with changes to its program to reward third parties for working with multiple product areas. The Next conference will continue Thursday and Friday with more Google keynotes. Greene said that Thursday will bring a host of product news across Google Cloud’s offerings. One announcement will likely be the company’s Meet enterprise videoconferencing service.